Bruce Babbitt will manage a fragmented and dysfunctional Department of the Interior. 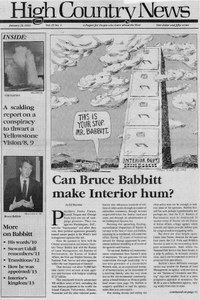 Can Bruce Babbitt make Interior hum? Babbitt wins as Secretary of the Interior by a narrow margin. The former Secretary of the Interior, Stewart Udall, speculates on Babbitt's effect on the agency. Senior BLM director, Bob Moore, gives his opinion on appointees and career people. A review of "Tracking and the Art of Seeing: How to Read Animal Track and Sign', by Paul Rezendes. The book "Seeds of Change' examines massive agricultural changes arising from contact between the continents. The Fish and Wildlife Service is slow to confirm wolf sightings, which could affect wolf reintroduction in Yellowstone. Transfers among Forest Service employees from several Idaho national forests are political, employees say. The FAA agrees to strictly enforce flight-free zones over the Grand Canyon. The President of the Montana Wilderness Association's governing council offers an opinion on the Montana Wilderness bill.